… I didn’t discover that the photoer had been caught in the picture until later. Taken from on a train while going through Blackfriars station. As you can probably tell, it was just taken using a phone. I emailed Darren back, saying I’d feature his photo here. He then said that I shouldn’t feel in any way obligated to do this. He just thought I’d like the photo. I thought about why I was so glad to receive this photo, and so keen to show it here, along with what he says about it. I think the reason is that Darren clearly “gets”, as they say, this blog. He gets that I am fond of the unfolding and ongoing drama of the architecture of central London. He gets that I notice how others like to photo London, too, it’s not just me. 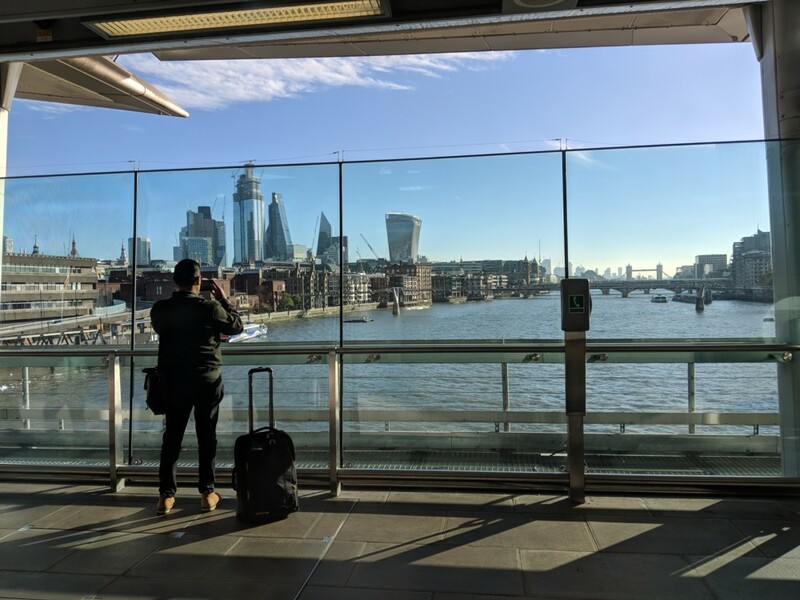 He gets that I am fond of the new Blackfriars railway station, straddling the river the way it does, and that I love the sort of views you can see and photo from it. And, Darren gets that I am deeply impressed by the photographic prowess of mobile phones. He even refers to his photographer as a “photoer”. Until now, that was just me.